As some of you might have noticed, things have been a little slow around here lately. I'm currently in the process of packing up the house and moving, so I haven't had nearly as much time to muck about on here as I'd have liked to. The site will be back up and running at full speed hopefully in about a week or two, once the moving stuff has been dealt with. The forum is of course still open and available, and I'll pop in there from time to time when I have a moment to see what's going on. I just wanted to let everyone know the reason for the lack of activity. I'm still checking e-mail as well, so those of you forwarding me SAM file updates and whatnot (including job opportunities-thanks Frank!) are more than welcome to continue doing so. I might not reply right away, but I'll still get your mail. What you've got there is a lineup of SS-25 TELs and open single-bay garages, likely for START treaty verification purposes. 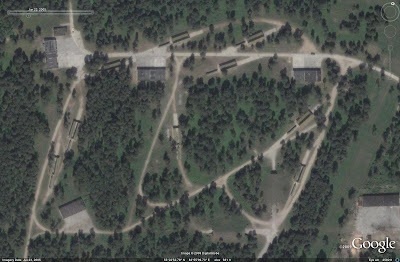 Fun stuff, mess around with the historical imagery in the area and see if you can find the other Novosibirsk SS-25 garrison showing the same thing!